The Grammy Awards have always been a fun and funky celebration -- but one that took place in a universe far removed from us. Sure, once in a while a name from Hawaii would show up on the nominations list -- under "world music," for example. But for the most part, Hawaii had little stake in these awards. That all changed last year, when a Grammy category was added for Hawaiian music. Now we have five candidates who will be putting on the glitz for Wednesday's ceremony, vying for that Grammy. Add to them Hawaii's Jack Johnson, who is nominated twice -- in the pop vocal performance category alongside Paul McCartney and Stevie Wonder, and in the pop collaboration category for his song "Gone Going" with the Black Eyed Peas. All this gives us plenty of reason to pay attention on Wednesday. Hawaii's resident nominees are counting down the days and making plans as to how they are going to represent the islands in Los Angeles. The 48th Annual Grammy Awards airs 7 p.m. Wednesday on KGMB/CBS, from the Staples Center in Los Angeles. 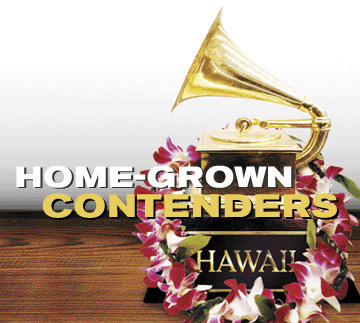 Note: The Hawaiian music Grammy is not part of the televised show; it will be awarded earlier in the day. Awards in Jack Johnson's categories will be televised. Sonny Lim is making his second trip to the Grammys, but he says the stakes are higher this time. 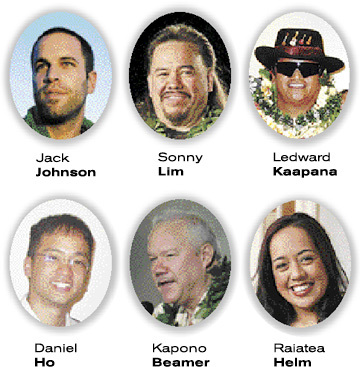 Last year, he was among artists on producer Charles Michael Brotman's "Slack Key Guitar Vol. 2," which won the first-ever Hawaiian music Grammy. The award for a compilation goes to the producer, not participating artists, and Lim was there to support Brotman. The positions are reversed this year, with Lim attending as a Grammy finalist for the solo album Brotman produced for him, "Slack Key Guitar: The Artistry of Sonny Lim." "It's a whole lot different to go back (as a nominee). It's a whole different feeling ... even a little spooky, but I'm glad to be a part of the whole thing," Lim says. He leaves today, taking his wife and his mother as his guests and support group. Lim plans to represent his home island by wearing an akulikuli lei, made from a flower found only in Waimea on the Big Island. Raiatea Helm, raised on Molokai and now living on Maui, is nominated for "Sweet & Lovely," which has already won several local Na Hoku Hanohano Awards. Helm has been slowed down in recent weeks by a bad cold and ended up not having enough time to work with a local designer who'd expressed an interest in fitting her with a dress for the awards ceremony. With time running out, Helm bought something off the rack at an upscale local department store. The important thing, she says, is being there. "I'm excited to go there and see Mariah Carey and all the big celebrities, and I think it will be a great experience to go there and also represent Hawaii and also perpetuate the importance of Hawaiian music." Since most of the songs on Kapono Beamer's "Slack Key Dreams of the Ponomoe" address his family heritage, it's fitting that Beamer and his wife, Dana, are taking his musician son, Kamana, with them. "I know one thing for certain: One of the five nominees will win, so we're going -- to find out who it is!" Beamer says with a hearty chuckle, sounding like the music-industry veteran he is. But seriously, he continues, "The Grammys are giving us (all) a tremendous opportunity to educate the general public and the voting membership of the Grammys about Hawaiian music. Right now, they've kind of latched onto slack key, but I think as years go by ... people will discover the richness, the talent, the artistry that Hawaii has to offer, from traditionalists to modernists. "Other than that, we're just going with good spirits and open eyes, and looking forward to hearing the big-league performers perform during the telecast. It'll be a thrill." Beamer is taking "maile, ilima and some other leis" to wear at the various events he'll be attending during the week. A reception for the Hawaii nominees will be held on Monday, a reception for all the nominees Tuesday, the awards show itself Wednesday and the after-parties. "I'm (also) going to take my nose flute for good luck. If someone is insistent that I perform, I'll just whip it out." Ledward Kaapana, as usual a man of few but well-chosen words, left for Los Angeles with his wife, Sharon, on Thursday. Kaapana, nominated for his umpteenth solo album, "Kiho'alu: Hawaiian Slack Key Guitar," says he is even more excited than when the nominations were announced in December, "and a little nervous." The final nominee is the compilation album "Masters of Hawaiian Slack Key Guitar Volume 1." Kaapana is among artists featured on that album. Producer Daniel Ho, a resident of Los Angeles whose record label is also based in that city, would share the award with co-producers Paul Konwiser and Wayne Wong.